• Operator is 24 Volt DC and includes built-in battery backup. 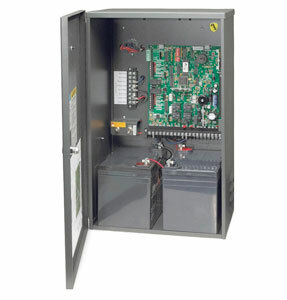 • 115/230 VAC Input (switch selectable) or 24 VDC Solar Power Input. • 1/2 HP Quadra Drive Heavy-Duty DC Motor. • Two 7.2 Ah Batteries standard, 18 Ah batteries optional. • Maximum gate width 16 feet (4.88m). • Maximum gate width 40 feet (12.2m). 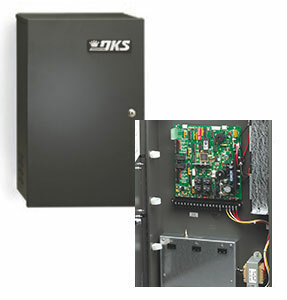 • Moves gates up to 13 feet with a powerful screw drive system. • Ideal for farms, ranches, and reisdential applications. 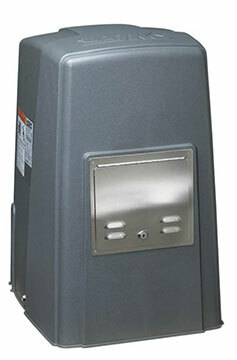 • Fully enclosed screw drive for added saftey and reliability. • Compact design for gates up to 10 feet. • Ideal for residential applications. • Strong gear reduction system in small, compact design. • Ideal for residential gates up to 8 feet. • Smooth operation is great for closing overlapping dual gates. • Virtiually invisible, a perfect match for high-end designer gates. • Easy access with removable cover. • Converts 115 VAC to 24 VDC operating voltage. • Magnetic lock power circuit. • Includes two (2) 3.5 Ah back-up batteries. • Deluxe control box includes three (3) 115 VAC convenience outlets. 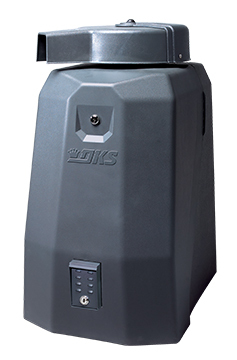 • Ideal for remote locations where 115 VAC power is not available. • 0.0 Amp SBPD circuit (Pat Pend) assures battery power is not used during idle times. • Solar panel recharges battery power. • 18 Ah and 35 Ah battery options - or supply your own batteries.